Rise and Resist, along with co-sponsors No IDC NY, True Blue NY, VOCAL-NY, United through Action, Empire State Indivisible, Inwood Indivisible, Indivisible Harlem, Patriotic Millionaires, NY Communities for Change and Downtown Women for Change, is protesting outside a big-ticket fundraiser for the Speaker Heastie PAC to accuse Speaker Carl Heastie and the Democrats of the NY Assembly of failing New Yorkers. Carl Heastie and a majority of the Assembly Democrats have proven themselves to be hypocrites. In 2016 Heastie was the lead sponsor on a bill to provide public financing of elections — a bill that cost him nothing because both he and his donors knew it had no chance of passing the GOP-controlled Senate. However, in 2019, with a Democratic Senate ready to pass sweeping campaign finance reforms to get big money out of politics, Heastie bowed to the pressure from his big donors and failed to include small donor matching funds (and the accompanying limits on big donations) in the budget. Heastie is getting his reward for that hypocrisy today, with big donors spending big money to dine with him at Terroir. Heastie and the Democrats in the Assembly also backed down on finding ambitious new sources of revenue for our starving public schools because of pressure from REBNY (the Real Estate Board of New York), one of the biggest and most problematic donors to NY legislators. A pied-a-terre tax would have solved many problems at once, but it was opposed by REBNY so the Assembly wouldn’t implement it. “After a record of backing public financing of elections when the Senate was controlled by the GOP, Heastie suddenly doesn’t support fair elections now that the Senate is blue, has punted public financing into a ‘commission,’ and has immediately turned around and is holding a high dollar fundraiser for his PAC. 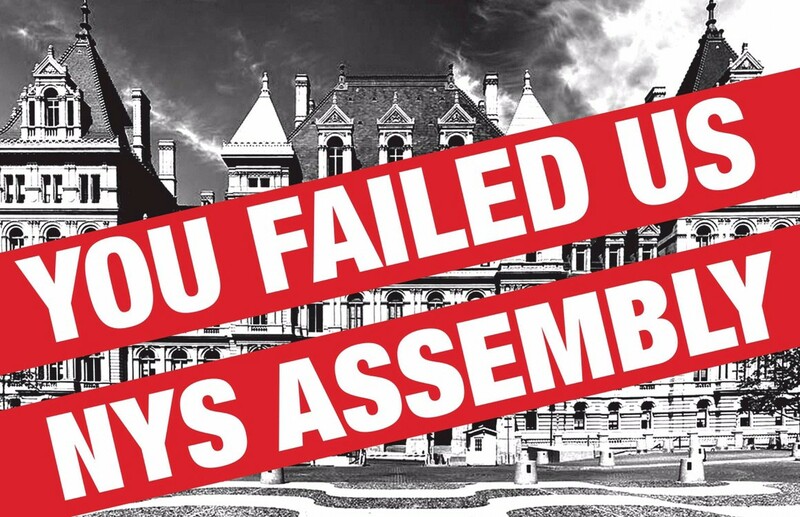 Now that we got rid of the IDC, we see clearly that the obstructionist body of the NY legislature is the Assembly,” says Harris Doran of No IDC NY. Rallying with the themes of “Heastie Failed Us,” “The NYS Assembly Failed Us,” and “Get Big Money Out of Politics,” a loud and determined group of activists is making sure that Heastie and his pals know how angry we are. We are a direct action group committed to opposing, disrupting, and defeating any government act that threatens democracy, equality, and our civil liberties.